Did you know that beaches aren’t always white? They can come in a whole array of colours – some beaches being quite famous for their colours. Here are some photos to tempt you – believe it or not, all from the island state of Hawaii. 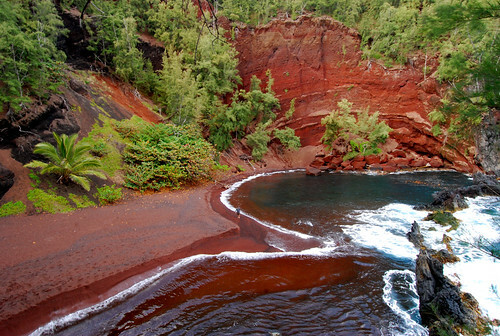 The Red Sand Beach on the island of Maui is one of Hawaii’s most iconic beaches. Despite that, it isn’t crowded, because it’s hard to get to – you’ve got to get to the eastern part of the island, then a bit of a rough trail to get to the beach. If red doesn’t take your fancy, then how about Hawaii’s green sand beach? The green beach, called Papakolea Beach, is on the southern tip of the Island of Hawaii. The colour is because of the crystals found in the volcanic crystals that made this island. I know of a couple of green beaches in the far north of Scotland (not quite as warm), and there is also a famous green beach in Guam. 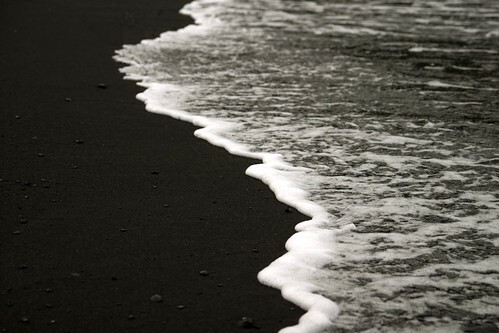 Careful on this one – that black beach can be hot! Hawaii has several black sand beaches – Punalu’u near Hilo on the Island of Hawaii is probably one of the most well known and the largest, but there are several on the Island of Hawaii and Maui. The colour is due to the volcanic ash that darkens the sand. Hawaii doesn’t have exclusivity on black beaches either – you’ll find them in the Canaries, Alaska, Iceland and California. You don’t have to head to any of these unique beaches, though; lots of yellow and white sand can be found all over. 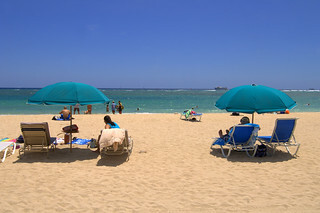 Where are the best beaches in Hawaii? That’s hard to say – everyone has their own opinion. I think when it comes to white sand and relaxation, Oahu and Maui get top props, while if you want some quiet and peace, Kauai offers a few great choices as well. You might have to spend a couple of weeks here and decide for yourself! Andy Hayes is a travel journalist currently based in Seattle, Washington. When not soaking up the Pacific Northwest lifestyle or enjoying life on the road, he is spending time hanging out on his own travel lifestyle magazine, Sharing Travel Experiences.